Paraspeckles are subnuclear bodies assembled on a long non-coding RNA (lncRNA) NEAT1. 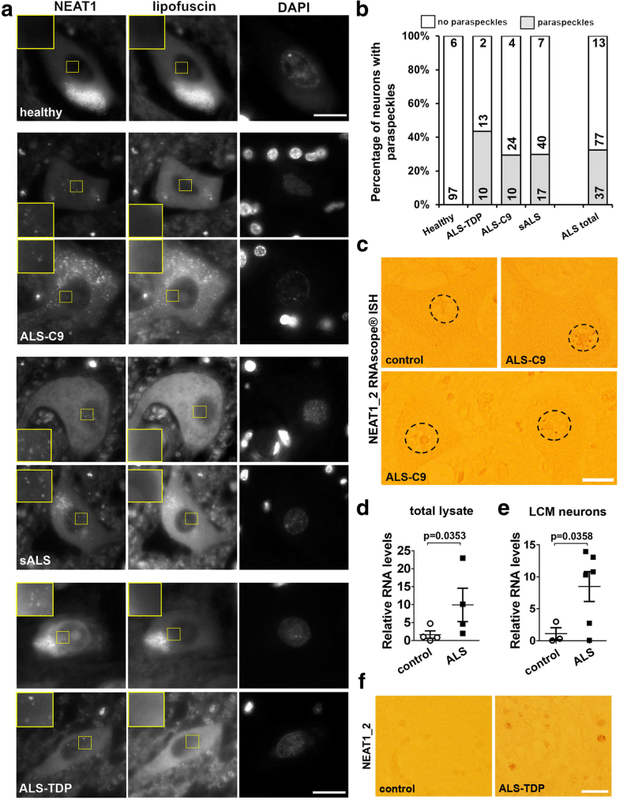 Their enhanced formation in spinal neurons of sporadic amyotrophic lateral sclerosis (ALS) patients has been reported but underlying mechanisms are unknown. The majority of ALS cases are characterized by TDP-43 proteinopathy. In current study we aimed to establish whether and how TDP-43 pathology may augment paraspeckle assembly. Paraspeckle formation in human samples was analysed by RNA-FISH and laser capture microdissection followed by qRT-PCR. Mechanistic studies were performed in stable cell lines, mouse primary neurons and human embryonic stem cell-derived neurons. Loss and gain of function for TDP-43 and other microRNA pathway factors were modelled by siRNA-mediated knockdown and protein overexpression. We show that de novo paraspeckle assembly in spinal neurons and glial cells is a hallmark of both sporadic and familial ALS with TDP-43 pathology. Mechanistically, loss of TDP-43 but not its cytoplasmic accumulation or aggregation augments paraspeckle assembly in cultured cells. TDP-43 is a component of the microRNA machinery, and recently, paraspeckles have been shown to regulate pri-miRNA processing. Consistently, downregulation of core protein components of the miRNA pathway also promotes paraspeckle assembly. In addition, depletion of these proteins or TDP-43 results in accumulation of endogenous dsRNA and activation of type I interferon response which also stimulates paraspeckle formation. We demonstrate that human or mouse neurons in vitro lack paraspeckles, but a synthetic dsRNA is able to trigger their de novo formation. Finally, paraspeckles are protective in cells with compromised microRNA/dsRNA metabolism, and their assembly can be promoted by a small-molecule microRNA enhancer. Our study establishes possible mechanisms behind paraspeckle hyper-assembly in ALS and suggests their utility as therapeutic targets in ALS and other diseases with abnormal metabolism of microRNA and dsRNA. Amyotrophic lateral sclerosis (ALS), the most common form of motor neuron disease, is a severe adult-onset neuromuscular disease affecting motor neurons in the spinal cord, brainstem and motor cortex. Up to 90% of ALS cases are sporadic (sALS), the rest 10% bear a strong genetic component (familial ALS, fALS), and currently mutations in more than 20 genes are known to cause fALS . The complexity of the disease hinders development of ALS therapeutics, and those two drugs that have been approved for the treatment of ALS so far, riluzole and edaravone, have very limited efficacy. A multifunctional RNA-binding protein TDP-43 encoded by TARDBP gene is believed to be the main culprit in ALS: TDP-43 pathology is typical for ~ 95% of sALS cases and for fALS cases caused by C9ORF72 gene mutation ; in addition, dozens of mutations in TARDBP have been identified in fALS and sALS patients [3, 4]. Hallmarks of all these ALS cases include protein clearance from the nucleus, its cytoplasmic accumulation and aggregation [5, 6]. Therefore, both loss and gain of TDP-43 function are implicated in ALS however the relative contribution of these two mechanisms is still debated. The paraspeckle is a prototypical nuclear body localized on the border of splicing speckles . A long non-coding RNA (lncRNA) NEAT1 serves as a scaffold for paraspeckles, spatially organizing a variety of proteins by direct binding or piggy-back mechanism [8–11]. The NEAT1 locus produces two transcripts, NEAT1_1 and NEAT1_2. The longer NEAT1 isoform, NEAT1_2, is essential for paraspeckle assembly [10, 12]. Functions of paraspeckles described so far include nuclear retention of specific RNAs, including inverted Alu repeat-containing transcripts; regulation of gene expression by sequestration of transcription factors; and modulation of miRNA biogenesis [13–16]. There is an established association of paraspeckles and their components with a variety of pathological states and conditions, from cancer to neurodegeneration. Paraspeckles protect cancer cells against DNA damage and replication stress, regulate hormone receptor signaling and hypoxia-associated pathways thereby increasing their survival [17–19]. Paraspeckles become enlarged in cells primed by viral or synthetic double-stranded (ds) RNAs and play an important role in antiviral response . An unusually tight association of paraspeckle components with neurodegenerative conditions, and ALS in particular, has recently emerged. Firstly, enhanced paraspeckle formation has been reported in spinal motor neurons of sALS patients . This finding was surprising because levels of the longer NEAT1 isoform, NEAT1_2, essential for paraspeckle formation, are very low in the adult nervous system . Secondly, at least seven paraspeckle proteins, including TDP-43 and FUS, are genetically linked to ALS and a related condition, frontotemporal lobar degeneration (FTLD) [22–25]. FUS, a protein structurally and functionally similar to TDP-43, is required to build paraspeckles [8, 23]. TDP-43 association with paraspeckles has also been reported . TDP-43 directly binds NEAT1, and this interaction is increased in the brain of FTLD patients [26, 27]. Overall, currently available data support the role of paraspeckles in molecular pathology of ALS, however the underlying mechanisms of their enhanced formation in spinal neurons are not understood. In current study we show that loss of TDP-43 is sufficient to stimulate paraspeckle formation – a phenomenon likely linked to the function of TDP-43 in microRNA (miRNA) processing and as an RNA chaperone. Furthermore, we provide evidence that paraspeckles are protective in cells with impaired function of the miRNA machinery and those with activated dsRNA response. Finally, we show that enoxacin, an enhancer of the miRNA pathway, promotes paraspeckle formation. SH-SY5Y neuroblastoma cells and MCF7 cells were maintained in 1:1 mixture of Dulbecco’s Modified Eagle’s Medium and F12 medium supplemented with 10% fetal bovine serum (FBS), penicillin-streptomycin and glutamine (all Gibco, Invitrogen). For differentiation into neuron-like cells, SH-SY5Y cells were grown on poly-L-lysine (Sigma) coated coverslips in advanced DMEM/F12 (ADF)/Neurobasal A mixture supplemented with 10 μM all-trans retinoic acid (Sigma), B27 (Life Technologies) and BDNF (Miltenyi, 10 ng/ml) for 6 days. The following gene-specific siRNAs were used: ADAR1; Dicer; Drosha; FUS; Ago2; IFNB1 (all Life Technologies, Silencer®); TARDBP (Silencer Select®, s23829 and EHU109221, Mission® esiRNA, Sigma); NEAT1 (Silencer Select®, n272456). Scrambled negative control was AllStars from Qiagen. Plasmids for expression of TDP-43 dNLS and TDP-43 C-termical fragment are described elsewhere . Cells were transfected with siRNA (400 ng/well), plasmid DNA (200 ng/well) or poly(I:C) (Sigma, 250 ng/well) using Lipofectamine2000 (Life Technologies) in 24-well plates. TDP-43 specific shRNA plasmid was from Sigma (MISSION® SHCLNG-NM_007375). To delete the NLS of endogenous TDP-43, Feng Zhang lab’s Target Finder (http://crispr.mit.edu/) was used to identify guide RNA target sequences flanking the genomic region of TARDBP gene encoding NLS. Respective forward and reverse oligonucleotides for two pairs of guides were annealed and cloned into pX330-U6-Chimeric_BB-CBh-hSpCas9 (pX330) vector provided by Feng Zhang (Addgene deposited plasmid) as described . MCF7 cells were transfected with plasmids encoding upstream and downstream guide RNAs (500 ng/well) using Lipofectamine2000 and analysed after 72 h. Guide RNA sequences: T1: 5’-TTATTTAGATAACAAAAGAAAAA-3′, T2: 5’-AACATCCGATTTAATAGTGT-3′, T3: 5’-GGAATTCTGCATGCCCCAGATGC-3′, T4: 5’-ACATCCGATTTAATAGTGTT-3′. Cellular treatments were as follows: 1 × 104 IU interferon beta-1a (IFNbeta), 0.5 μg/ml LPS, 100 μg/ml zymosan, 50 μM suramin, 500 nM TSA, 2 mM sodium butyrate, 10 and 50 μM enoxacin, 10 μM riluzole, 10 μM edaravone (all Sigma). Human ES cell derived neurons were transfected with 15 μg/well of poly(I:C) using FuGENE®HD (Promega). Enoxacin, edaravone and riluzole toxicity was assessed using resazurin-based CellTiter-Blue Cell Viability Assay (Promega). Primary cultures of mouse hippocampal neurons were prepared from P0 CD1 mice as described  and maintained for 5–14 days. Cultures of human neural precursor cells (NPCs) and motor neurons differentiated from H9 hES cell line were prepared as described previously . Briefly, hES cells were maintained in mTESR2 media (Stemcell Technologies) on Matrigel® (Corning) coated dishes. Confluent hES H9 cultures were switched to differentiation medium composed of ADF supplemented with SB431542 (10 μM, Abcam). Purmorphamine (1 μM, Cayman Chemicals) and retinoic acid (0.1 μM, Sigma) were added on Day 4. On Day 8, cells were split in 1:2 ratio and on Day 16, NPCs were dissociated using Accutase®, plated onto Matrigel® coated dishes and cultured in ADF with GlutaMAX, penicillin-streptomycin, B27 (12587–010) and N2 supplements (all Life Technologies) and BDNF (Miltenyi, 10 ng/ml). On Day 23, Accutase® was used to re-plate neurons on dishes/coverslips at desired density. Neurons were cultured in 50:50 mixture of ADF/Neurobasal A with the above supplements until Day 40. Cells were fixed on coverslips with 4% paraformaldehyde on ice for 15 min and permeabilized in cold methanol (or 70% ethanol in case of RNA-FISH). Coverslips were incubated with primary antibodies diluted in blocking solution (5% goat serum in 0.1% Triton X-100/PBS) for 1 h at RT or at 4 °C overnight. Secondary Alexa488- or Alexa546-conjugated antibody was added for 1 h at RT. For RNA-FISH, commercially available NEAT1 and MALAT1 probes (Stellaris® FISH Probes against human NEAT1, middle segment or 5′ segment, or human MALAT1, all Biosearch Technologies) were used as per standard protocol. Fluorescent images were taken using BX61 microscope equipped with F-View II camera and processed using CellF software (all Olympus). Paraspeckle quantification (number of individual paraspeckles per DAPI-visualised nucleus) was performed manually, by the same person for all conditions, blinded to the experimental condition. Clusters of paraspeckles were counted as a single paraspeckle. For quantification of cleaved caspase 3 positive cells, ‘Analyze particles’ tool of Image J software was used (8–10 fields were analysed per condition). Total cellular RNA was extracted using GenElute total RNA kit (Sigma) and possible DNA contamination was removed using RNase free DNase kit (Qiagen). First-strand cDNA synthesis were performed using random primers and Superscript IV (Invitrogen). For analysis of miRNA levels, RNA was extracted with QIAzol (Qiagen) followed by reverse transcription with Qiagen miScript II RT Kit. Real-time qPCR was conducted using SYBR green master mix as described . For miRNA quantification, forward miRNA-specific primers were used in combination with the universal reverse primer (unimiR). All primer sequences are given in Table 1. MCF7 cells were transfected with equal amounts of plasmids to express GFP-tagged FUS or NONO together with TARDBP siRNA or scrambled control siRNA. After 48 h, cells were scraped in RIP buffer prepared using RNase-free water (1xPBS with 1% Triton-X100 and protease inhibitors cocktail). Cells were left on ice for 10 min with periodic vortexing, and the lysate was centrifuged at 13,000 rpm for 10 min. GFP-Trap® beads (Chromotek) were washed in RIP buffer 4 times and added directly to cleared cell lysates with subsequent rotation at + 4 °C for 3 h. Beads were washed 4 times in RIP buffer and RNA was eluted by resuspension in TRI-reagent (Sigma). RNA was purified according to manufacturer’s protocol, and equal amounts of RNA were used for cDNA synthesis as described above. Total cell lysates were prepared for Western blot by lysing cells in wells in 2× Laemmli (loading) buffer followed by denaturation at 100 °C for 5 min. Proteins were resolved by SDS-PAGE and transferred to PVDF membrane (Amersham) by semi-dry transfer. The membrane was blocked in 4% non-fat milk in TBST and incubated in primary antibodies prepared in milk or 5% BSA overnight. Secondary HRP-conjugated antibodies were from Amersham. For detection of proteins, WesternBright Sirius ECL reagent (Advansta) was used. β-actin was used for normalisation. The following commercial primary antibodies were used: TDP-43 (rabbit polyclonal, 10782–2-AP, Proteintech and mouse monoclonal, MAB7778-SP, R&D Biosystems); FUS (rabbit polyclonal, Proteintech, 11570–1-AP); p54nrb/NONO (rabbit polyclonal C-terminal, Sigma); PSF/SFPQ (rabbit monoclonal, ab177149, Abcam); Tuj (β-Tubulin III, mouse monoclonal, Sigma); dsRNA (mouse monoclonal, J2, Kerafast); cleaved caspase 3 (rabbit polyclonal, 9661, Cell Signaling); NF-κB p65 (rabbit monoclonal, D14E12, Cell Signaling); IFIT3 (rabbit polyclonal, Bethyl); p-eIF2α (rabbit monoclonal, ab32157, Abcam); p-PKR (rabbit polyclonal, Thr451, ThermoFisher); PKR (mouse monoclonal, MAB1980-SP, R&D Systems); eIF2α (rabbit monoclonal, D7D3, Cell Signaling); β-actin (mouse monoclonal, A5441, Sigma). Antibodies were used at 1:500–1:1000 dilution for all applications. Human spinal cord paraffin sections from a panel of clinically and histopathologically characterised ALS cases and neurologically healthy individuals were obtained from the Sheffield Brain Tissue Bank and MRC London Neurodegenerative Diseases Brain Bank (Institute of Psychiatry, King’s College London). Consent was obtained from all subjects for autopsy, histopathological assessment and research were performed in accordance with local and national Ethics Committee approved donation. Human spinal cord sections were 7 μm thick. For conventional RNA-FISH, slides were boiled in citrate buffer for 10 min, washed in 2xSSC prepared with DEPC-treated water and incubated with NEAT1 probe (Stellaris® FISH Probes against human NEAT1 5′ segment, Biosearch Technologies) diluted in hybridisation buffer (10% formamide/2xSSC, 5 μl probe in 200 μl buffer per slide under a 24 × 60 mm coverslip) in a humidified chamber at 37 °C overnight. Nuclei were co-stained with DAPI. Paraspeckles were analysed using BX61 microscope/F-View II camera (Olympus) at 100× magnification. For RNAscope® ISH analysis, Hs-NEAT1-long (411541) probe (Advanced Cell Diagnostics) was used according to manufacturer’s instructions. For qRT-PCR analysis, total RNA was extracted from thick frozen spinal cord sections and cDNA prepared using Ready-To-Go You-Prime First-Strand Beads (GE Healthcare). For laser capture microdissection (LCM), frozen spinal cord sections (total of 5 sections per patient/case) were cut into 5–10 μm thin sections using a cryostat, mounted on glass slides and fixed in cold acetone for 3 min. Sections were stained using toluidine blue, dehydrated in ascending alcohol series for 30 s and placed in xylene for 1 min. The PixCell® II Microdissection system (Applied Biosystems) was used for LCM. Motor neurons from the anterior grey horn were laser captured (300–500 or 30–80 per patient for healthy controls and ALS cases respectively), with the Macro-LCM cap films peeled and placed in test tubes with 50 μl extraction buffer (Pico Pure® RNA Isolation Kit; Thermo Fisher Scientific) on ice. The extracted films were incubated at 42 °C with the extraction buffer for 30 min and frozen at -80 °C until RNA extraction. Total RNA purification was performed using the above kit as per manufacturer’s instructions. RNA samples were analysed using the Agilent RNA 6000 Pico Kit (Agilent Technologies®) and used for qRT-PCR. GraphPad Prism software was used for statistical analysis. Statistical test used in each case is indicated in the figure legend. N indicates the number of biological replicates. On all graphs, error bars represent SEM. Augmented paraspeckle assembly has been previously reported in sALS spinal cord neurons as compared to non-ALS controls . We sought to verify this result in a separate cohort of sALS cases as well as to extend this analysis to fALS. In total, 7 sALS cases, 2 cases with TARDBP mutations and 4 cases with C9ORF72 mutations alongside with 6 healthy controls were examined by RNA-FISH with NEAT1 probe. No neurons with paraspeckles were detected in the spinal cord of healthy individuals (97 neurons analysed), however such neurons were present in up to 40% of neurons in all ALS cases examined (Fig. 1a and b). We also confirmed the presence of paraspeckles in ALS motor neurons using RNAscope® ISH (Fig. 1c). Consistently, qRT-PCR analysis of spinal cord tissue from four healthy controls and four ALS patients demonstrated elevated NEAT1 levels in the latter group (Fig. 1d). We further performed laser capture microdissection (LCM) of spinal neurons in the ventral horn and analysed NEAT1_2 levels by qRT-PCR (n = 3 for controls and n = 6 for ALS patients, including three sALS and three ALS-C9 cases). NEAT1_2 levels were indeed significantly upregulated in LCM neurons of ALS patients (Fig. 1e). Finally, using RNAscope® ISH, we also analysed the presence of paraspeckles in non-neuronal cells. Wide-spread paraspeckle assembly in glial cells in ALS spinal cord was observed (n = 6 for controls and n = 4 for ALS patients, including two sALS, one ALS-TDP and one ALS-C9 case) (Fig. 1f). Thus, de novo paraspeckle formation is typical for spinal motor neurons and glial cells of individuals affected by ALS with primary or secondary TDP-43 pathology. We next sought to determine possible mechanisms underlying paraspeckle hyper-assembly in ALS. TDP-43 pathology in the spinal cord is very common in ALS, being present in almost all sALS cases, fALS cases caused by mutations in TARDBP gene itself as well as those caused by C9ORF72 gene repeat expansions [2–4, 31]. TDP-43 has been identified as a paraspeckle protein , thus we tested the possibility that TDP-43 dysfunction affects paraspeckle assembly. Hallmarks of TDP-43 proteinopathy are clearance of the protein from the nucleus and its accumulation and aggregation in the cytoplasm [5, 6]. We first modelled loss of TDP-43 function in two stable cell lines. By using specific siRNA, ~ 90 and 50% TDP-43 knockdown was achieved in MCF7 and neuroblastoma SH-SY5Y cells, respectively (Fig. 2a; Additional file 1: Fig. S1a). TDP-43 depletion led to a significant increase of the number of paraspeckles per nucleus (Fig. 2b and c; Additional file 1: Fig. S1b). Consistently, the paraspeckle-specific NEAT1 isoform, NEAT1_2, was upregulated in cells transfected with TDP-43 siRNA (Fig. 2a; Additional file 1: Fig. S1a). Similar results were obtained using an independent TDP-43 siRNA pool and an shRNA targeting TDP-43 (Additional file 1: Fig. S1c and d). In contrast, we did not observe changes in the levels or distribution of another abundant lncRNA, MALAT1, a component of splicing speckles (Fig. 2a; Additional file 1: Fig. S1e). Levels of core paraspeckle proteins SFPQ, NONO and FUS were also unaffected by TDP-43 knockdown (Additional file 1: Fig. S1f). We next examined whether TDP-43 knockdown would result in enhanced association of core paraspeckle proteins with NEAT1_2. Plasmids to overexpress GFP-tagged FUS or NONO proteins were co-transfected with scrambled or TDP-43 siRNA followed by RNA immunoprecipitation with GFP-Trap beads. Indeed, by PCR, both FUS and NONO demonstrated increased association with NEAT1_2 in TDP-43 depleted cells (Fig. 2d). To verify that paraspeckles formed in TDP-43 depleted cells are functional, we measured the expression of established paraspeckle-dependent genes, IL8 and ADARB2, known to be positively and negatively regulated by paraspeckles, respectively [13, 14]. Indeed, IL8 mRNA was upregulated and ADARB2 mRNA decreased upon TDP-43 knockdown (Fig. 2e). Since nuclear clearance of TDP-43 in ALS is coupled to its cytoplasmic accumulation and aggregation, we next evaluated the effect of cytoplasmic TDP-43 on paraspeckles. TDP-43 lacking nuclear localization signal (TDP-43 dNLS) and a C-terminal TDP-43 fragment corresponding to ~ 25 kDa TDP-43 cleavage product (TDP-43 CT, aa. 191–414), both characterized by predominantly cytoplasmic distribution, were transiently expressed in neuroblastoma cells (Fig. 2f). However, neither paraspeckle numbers nor NEAT1 levels were affected by these cytoplasmic proteins (Fig. 2f and g). TDP-43 dNLS forms cytoplasmic aggregates in a fraction of cells, but their presence also did not affect paraspeckles (Fig. 2g, bottom panel). 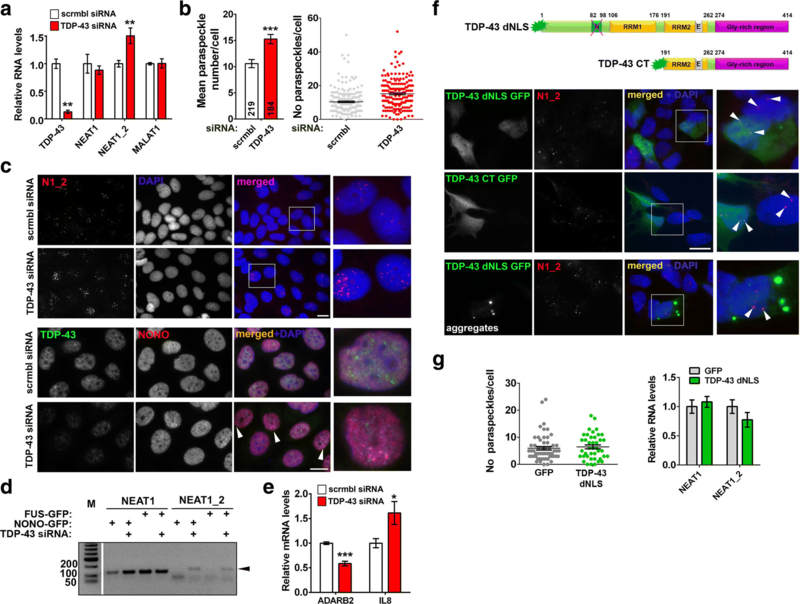 Finally, in order to recapitulate simultaneous nuclear depletion and cytoplasmic accumulation of TDP-43, we targeted endogenous TDP-43 out of the nucleus while preserving its total cellular levels by CRISPR/Cas9 editing of the endogenous TARDBP gene. Cells were transiently transfected with plasmids for expression of two independent guide RNA pairs targeting upstream and downstream sequences encoding NLS of TDP-43 (Additional file 1: Fig. S1 g). For both guide RNA pairs tested, 15–20% transfected cells displayed partial TDP-43 redistribution to the cytoplasm which nevertheless did not enhance paraspeckle assembly (Additional file 1: Fig. S1 h), suggesting that substantial loss of nuclear TDP-43 is required to produce an effect on paraspeckles. Overall, a decrease in cellular TDP-43 levels results in paraspeckle hyper-assembly. TDP-43 is known to contribute to miRNA biogenesis at two different levels, enhancing the activity of the Microprocessor in the nucleus and of the Dicer complex in the cytoplasm [32, 33]. Recently, paraspeckles have been shown to contribute to pri-miRNA processing by spatially organizing the Microprocessor and enhancing its processivity . We hypothesised that augmented paraspeckle assembly in cells depleted of TDP-43 might be a compensatory mechanism to counterbalance the effect of TDP-43 loss of function on miRNA processing. If this indeed is true, paraspeckle assembly should be also increased in cells with compromised function of the miRNA pathway. To test this hypothesis, we knocked down three core enzymes of the miRNA pathway, a Microprocessor component Drosha, the pre-miRNA processing ribonuclease Dicer and the RISC endonuclease Ago2, in neuroblastoma cells. In our analysis we also included ADAR1 protein recently reported to promote miRNA processing . Using specific siRNAs, we achieved at least 40% knockdown for each of these genes (Fig. 3a). Consistent with the major role of Drosha in pri-miRNA processing, its knockdown led to the build-up of pri-miRNAs; both Drosha and TDP-43 knockdown also resulted in significantly diminished levels of select mature miRNAs (Additional file 2: Fig. S2). RNA-FISH and paraspeckle quantification showed that downregulation each of the above proteins is accompanied by enhanced paraspeckle assembly (Fig. 3b and c) and upregulation of total NEAT1 and NEAT1_2 (Fig. 3d). Another ALS-linked protein, FUS, is structurally and functionally similar to TDP-43 and also plays a role in miRNA biogenesis , but it is a core paraspeckle protein required for paraspeckle integrity [8, 23]. As expected from its essential paraspeckle function, FUS depletion resulted in decreased paraspeckle numbers (Fig. 3b and c). Finally, a small molecule inhibitor of RISC loading, suramin , was also able to increase NEAT1_2 levels and promote paraspeckle assembly (Fig. 3e). Thus, interfering with the function of the miRNA pathway causes NEAT1 upregulation and enhanced paraspeckle formation in cultured cells. This may represent one of the mechanisms behind the effect of TDP-43 loss of function on paraspeckles. TDP-43 is known to bind and regulate long transcripts , and its loss correlates with accumulation of transcripts prone to form double stranded (ds) RNA . Conspicuously, regulation of cellular response to viral dsRNA is one of the best characterized functions of paraspeckles [14, 39]. Therefore, we considered abnormal accumulation of endogenous dsRNA in TDP-43 depleted cells as another mechanism underlying the effect of TDP-43 loss of function on paraspeckles. Critically, miRNA pathway itself is the biggest cellular source of dsRNA, and its factors Dicer, Drosha and ADAR1 are known to limit the accumulation of transcripts with extensive secondary structure [40–42]. We used J2 antibody, a gold standard for dsRNA detection , to study the presence of dsRNA species in cells depleted of TDP-43, Drosha, Dicer or ADAR1. An increase in J2-positive signal was obvious after knockdown of each of these genes (Fig. 4a and b, Additional file 3: Fig. S3a). In contrast, Ago2 or FUS knockdown did not cause dsRNA accumulation (Fig. 4b). J2 antibody was reported to recognise Alu repeats especially well . We next used primers which specifically detect Alu-containing RNAs . Dicer and Drosha but not TDP-43 or ADAR1 knockdown resulted in increased levels of Alu-containing RNAs as measured by qRT-PCR (Fig. 4c) indicating that a different repertoire of dsRNA species accumulate after knockdown of each gene. The build-up of dsRNA is known to trigger phosphorylation of PKR and eIF2α and activation of type I interferon (IFN) signaling. In cells transfected with TDP-43 siRNA, levels of phosphorylated PKR and eIF2α were elevated (Fig. 4d; Additional file 3: Fig. S3b), and the expression of IFNB1 and an IFN-stimulated gene (ISG) CXCL10 was increased (Fig. 4e). Since dsRNA response eventually converges on type I IFNs, we asked whether these cytokines can contribute to paraspeckle response in TDP-43 depleted cells. Firstly, we showed that IFNbeta is the main type I IFN induced by dsRNA in neuroblastoma cells (Additional file 4: Fig. S4a). IFNbeta simulation per se was sufficient to stimulate paraspeckle assembly, although the effect was transient (Fig. 4f). In line with this, ligands of TLR3 (poly(I:C)) and TLR4 (bacterial lipopolysaccharide, LPS) which stimulate IFNbeta expression, but not a TLR2 ligand zymosan which does not affect IFNbeta production, were able to boost NEAT1 expression and paraspeckle assembly (Additional file 4: Fig. S4b-d). Finally, co-transfection of IFNbeta siRNA was sufficient to reduce paraspeckle abundance in cells transfected with TDP-43 siRNA although did not abrogate the hyper-assembly completely (Fig. 4g). Taken together, these data suggest that endogenous dsRNA accumulation and associated type I IFN response represent one of the mechanisms behind augmented paraspeckle assembly caused by TDP-43 loss of function. We next examined whether paraspeckles confer protection to cells depleted of TDP-43 or stimulated with exogenous dsRNA. 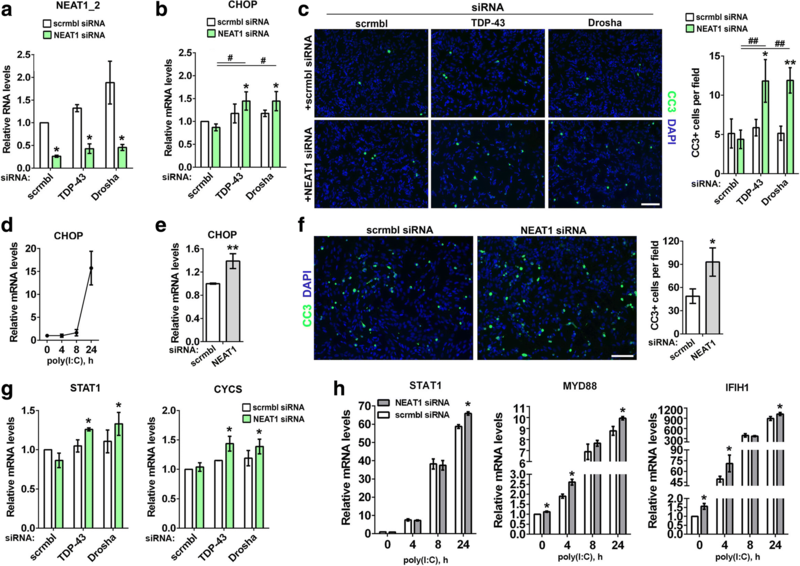 Neuroblastoma cells were transfected with siRNAs targeting TDP-43 or another Microprocessor component Drosha alone or in combination with NEAT1 siRNA. Cytotoxicity was assessed after 36 h using cleaved caspase 3 (CC3) and DNA damage-inducible transcript 3 also known as GADD153 or CHOP, a pro-apoptotic transcription factor [46, 47] as markers of apoptotic cell death. NEAT1 siRNA-mediated knockdown was equally efficient alone and in cells co-transfected with TDP-43 or Drosha siRNA, allowing 60% NEAT1_2 downregulation and loss of paraspeckles in the majority of cells (Fig. 5a and data not shown). We found that while knockdown of TDP-43 or Drosha alone did not result in significant cell death, simultaneous disruption of paraspeckles increased the rates of apoptosis for both genes studied (Fig. 5b and c). Although regulation of dsRNA response by paraspeckles is well documented , their ability to modulate dsRNA-induced apoptosis has not been addressed. We transfected cells with scrambled siRNA or NEAT1 siRNA and subsequently exposed them to a synthetic dsRNA analogue poly(I:C). Cultures depleted of paraspeckles had increased CHOP mRNA levels and higher numbers of CC3-positive cells after 8 h and 24 h of poly(I:C) stimulation, respectively (Fig. 5d-f). 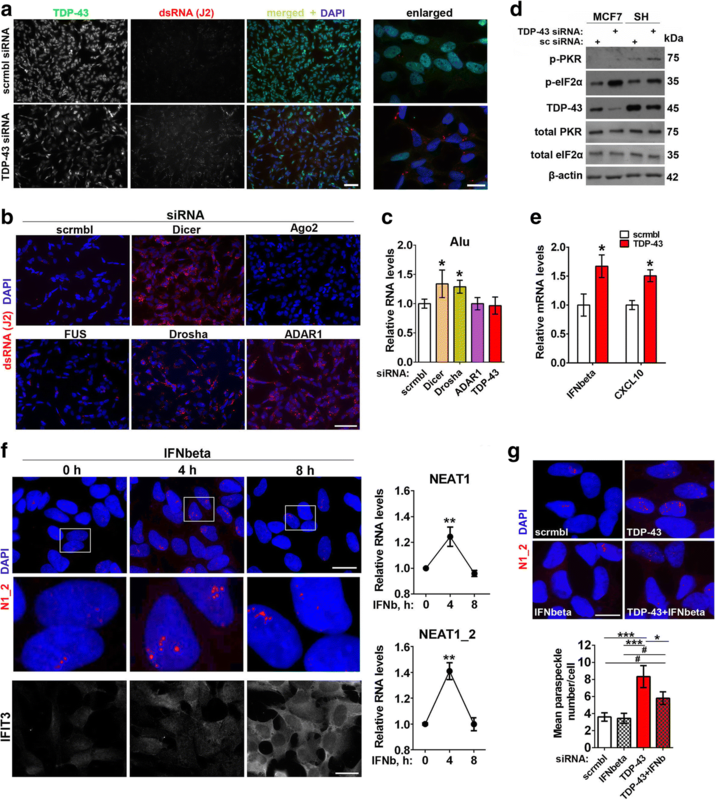 How does paraspeckle deficiency promote apoptosis in cells with compromised miRNA biogenesis and activated dsRNA response? A whole class of cytotoxicity-associated IFN-stimulated genes (ISGs) were reported to be negatively regulated by miRNAs . We found that potentially pro-apoptotic ISGs from this class, STAT1 and CYCS, were significantly upregulated in paraspeckle-deficient cells depleted of TDP-43 and Drosha (Fig. 5g). Furthermore, three such ISGs, STAT1, MYD88 and IFIH1, were consistently upregulated in NEAT1-depleted cells in the course of poly(I:C) stimulation (Fig. 5h). Thus, paraspeckles are protective against apoptotic death in cells with compromised miRNA machinery and/or activated dsRNA response. Normal postmitotic neurons in the brain or spinal cord of adult mice express very low levels of NEAT1_2 isoform and do not form paraspeckles in vivo . However it was not clear whether neurons cultured in vitro would acquire and preserve paraspeckles. First, we studied primary hippocampal cultures from newborn mice. While glial cells have readily detectable paraspeckles already at 5 days in vitro, neurons had no sign of paraspeckles even after 14 days in vitro (Fig. 6a). Next we examined paraspeckle assembly during differentiation of human ES cells into motor neurons. Human ES cells lack paraspeckles but they appear during differentiation (days 4–5 into differentiation, trophoblast stage) . 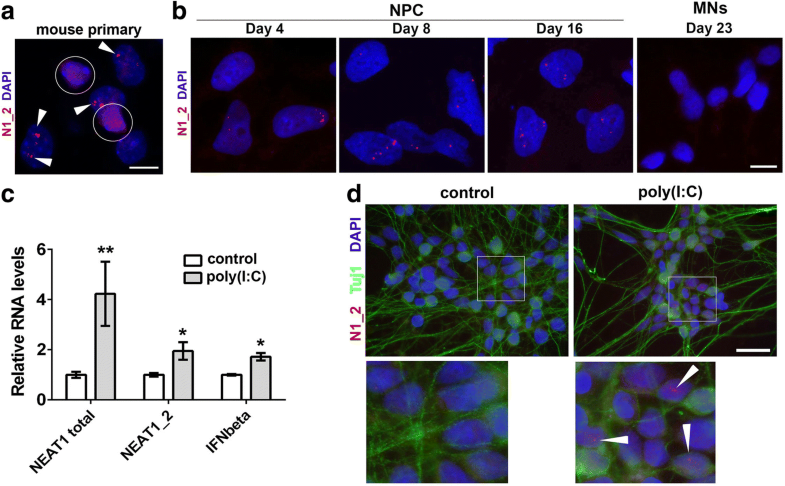 Consistent with this study, we started observing paraspeckles in Day 4 neural precursor cells (NPCs), and they were prominent in Day 8 and Day 16 NPCs (Fig. 6b). However, paraspeckles were absent even in immature (Day 23) neurons and onwards (Fig. 6b). In contrast, retinoic acid/BDNF-induced differentiation of SH-SY5Y neuroblastoma cells for 6 days did not affect their ability to form paraspeckles (Additional file 5: Fig. S5), suggesting fundamental differences in the biology of neurons and neuroblastoma-derived neuron-like cells. Thus, disappearance of paraspeckles marks the transition between human NPCs and neurons, whereas de novo paraspeckle assembly is not triggered by in vitro conditions in primary neurons. Finally, we tested whether inhibition of miRNA function, exposure to dsRNA or IFNbeta treatment can initiate paraspeckle formation in neurons. Human Day 40 motor neurons  were stimulated with poly(I:C) or treated with suramin or IFNbeta for 24 h. Induction of endogenous IFNbeta and NEAT1 was observed in poly(I:C)-treated neuronal cultures (Fig. 6c), and paraspeckles could be detected in a small fraction of poly(I:C)-stimulated neurons (Fig. 6d). In contrast, neither suramin nor IFNbeta induced paraspeckle assembly in neurons. Very few chemicals capable of stimulating paraspeckle assembly in cells with pre-existing paraspeckles have been identified so far. Proteasome inhibitors are known to promote NEAT1 synthesis and paraspeckle formation , however they are poor candidates as therapeutic molecules for ALS. Enoxacin is a small molecule enhancer of the miRNA pathway which stimulates the activity of the Dicer complex [50, 51]. In doing so, enoxacin increases levels of mature miRNAs thereby depleting miRNA precursors, pri-miRNA and pre-miRNA . Recently, enoxacin been shown to ameliorate pathology in mouse models of ALS . We studied the effect of enoxacin on paraspeckles in neuroblastoma cells. In addition, in our analysis we included HDAC inhibitors which were reported to stimulate NEAT1 expression  and two approved ALS therapeutics, riluzole and edaravone. Treatment with 10 μM enoxacin for 24 h increased NEAT1_2 levels and paraspeckle assembly in neuroblastoma cells (Fig. 7a and b); similar effect on paraspeckles was observed with short (4 h) treatment and with a higher enoxacin dose (Additional file 6: Fig. S6). Global HDAC inhibitors trichostatin A (TSA) and sodium butyrate (NaB) also significantly increased NEAT1_2 levels and led to the formation of large, elongated paraspeckles (Fig. 7a and b). Interestingly, edaravone but not riluzole also promoted paraspeckle biogenesis (Fig. 7a and b). None of the compounds studied was able to trigger de novo paraspeckles in hES cell derived motor neurons. Nuclear bodies spatially organize and modulate various cellular processes . Therefore it is not surprising that these membraneless organelles and their components have been implicated in multiple human diseases. Prominent examples are PML bodies and Gems linked to carcinogenesis and motor neuron degeneration, respectively [55, 56]. Paraspeckles have recently come into the limelight in the ALS field because of the extensive involvement of paraspeckle proteins in ALS pathogenesis. In the present study, we found that paraspeckle assembly in the spinal cord is shared by ALS cases with different aetiology and, as such, a hallmark of the disease. Using cell models, we identified two possible mechanisms which may initiate paraspeckle assembly in the spinal cord cells of the majority of ALS cases – compromised miRNA biogenesis and activated dsRNA response – both downstream of loss of TDP-43 function. In the CNS, miRNAs are highly abundant and are subject to abnormal regulation in many neurodegenerative diseases, including ALS [57–61]. Levels of mature miRNAs in ALS spinal cord were reported to be globally reduced [52, 57, 62]. This dysregulation is consistent with TDP-43 loss of function in the majority of ALS cases since this protein is a known miRNA biogenesis factor . An important role of paraspeckles in miRNA processing is supported by two recent studies [16, 63]. Thus, paraspeckle hyper-assembly in ALS motor neurons affected by TDP-43 loss of function may serve as one of the mechanisms to compensate for miRNA biogenesis deficiency. We also show that not only compromised function of the miRNA pathway but also its pharmacological enhancement results in paraspeckle hyper-assembly. This suggests that paraspeckles can respond to bi-directional changes in the activity of the miRNA pathway to either compensate for its compromised function or to meet the demand for miRNA precursors when its final step is over-active. Another function of TDP-43 is acting as a chaperone to control RNA secondary structure  and therefore cellular dsRNA response. Paraspeckles are known to respond to exogenous dsRNA (viral and its analogues) , and here we show that abnormal accumulation of endogenous dsRNA can also initiate paraspeckle response. Given a significant crosstalk between miRNA and dsRNA response pathways , it is not surprising that paraspeckles function as a regulatory platform for both pathways. Although dsRNA response triggered by dysfunction of the miRNA pathway factors is mediated via different molecular sensors, including TLR3 (for Drosha, our unpublished observations), MyD88 (for Dicer)  and MDA5/RIG-I (for ADAR1) , it eventually converges on type I IFN. In contrast to the previous study , we found that IFNbeta treatment alone can stimulate NEAT1 expression and paraspeckle formation. This discrepancy is likely due to the transient effect of IFN treatment on paraspeckles which peaks at the 4-h time-point, whereas in the previous work, the 24 h time-point was examined. It is possible that IFN levels oscillate to maintain the dsRNA response active but at the same time preserve cellular viability . Our in vitro data are consistent with a recent in vivo study demonstrating that TDP-43 knockdown in the adult murine nervous system leads to widespread upregulation of immune and, more specifically, antiviral genes . Loss of TDP-43 function in the nervous system might be sufficient to trigger a chronic neuroinflammatory response. In a previous study, siRNA-mediated TDP-43 knockdown led to decreased paraspeckle numbers in HeLa cells . One possible explanation for this discrepancy is differences in cellular response to dsRNA and/or differences in the miRNA pathway regulation between the cell lines. Indeed, in the study on TDP-43 functions as an RNA chaperone, dsRNA was shown to be accumulated only in the nucleus of HeLa cells, whereas in neuroblastoma M17 cell line it was mainly cytoplasmic , similar to our study. Another possibility is the reliance of paraspeckle assembly on some TDP-43 function(s) specifically in HeLa cells. Loss of TDP-43 function can explain paraspeckle hyper-assembly in the majority of ALS cases, i.e. almost all sALS cases as well as fALS cases caused by mutations in TARDBP and C9ORF72 genes. Recently, Drosha has been identified as a component of C9orf72 dipeptide inclusions in patient’s neurons . Therefore in fALS-C9 cases, loss of function for both TDP-43 and Drosha can jointly contribute to paraspeckle response. In a subset of sALS patients, activation of an endogenous retrovirus (ERV), HERV-K, was reported . Elevated expression of ERVs can initiate dsRNA response [70, 71]. Activation of HERV-K may therefore contribute to paraspeckle hyper-assembly at least in some sALS cases. It still remains to be established whether paraspeckle formation is typical for other fALS cases such as those caused by mutations in genes encoding SOD1, FUS, TBK1 or OPTN and, if so, the underlying mechanisms. Many of ALS proteins function in miRNA and dsRNA metabolism, for example FUS is involved in miRNA biogenesis and miRNA-mediated silencing [35, 72], whereas TBK1 is one of the central factors in dsRNA response and type I IFN signaling. Thus compromised function of these pathways may represent a common mechanism behind paraspeckle response in different ALS cases. Previously, paraspeckles were shown to be protective against cell death caused by proteasomal inhibition . In current study, we show that paraspeckles confer protection to cells with compromised metabolism of miRNA and activated dsRNA response. Intriguingly, many of miRNA-controlled cytotoxicity-associated ISGs  were also reported to be regulated by paraspeckles either by sequestration of transcription factors or by nuclear retention of edited RNAs [14, 49, 73] suggesting a multi-layered control of cellular toxicity by paraspeckles. It should be noted however that the effect of paraspeckle disruption on survival in stable cell lines was small both in this and in the previous  report, despite the use of cells completely lacking NEAT1 and hence paraspeckles in the latter study. Such limited effect is in line with the fact that NEAT1 knockout mice do not have an overt phenotype  and further supports a modulatory role for paraspeckles in cellular responses (such as miRNA biogenesis, gene expression, RNA retention) which only becomes relevant under stressful/pathophysiological conditions. However, such modulatory activities of paraspeckles might be particularly important for neurons coping with neurodegeneration-inducing stresses. Paraspeckle hyper-assembly might be broadly neuroprotective in ALS. As a word of caution, however, these data were obtained in stable cell lines with pre-existing paraspeckles. Since normal post-mitotic neurons are free from paraspeckles, the impact of their de novo formation on neuronal metabolism may be much more dramatic than in stable cell lines. For example, it is coupled with changes in the levels of the short NEAT1 isoform with diverse paraspeckle-independent regulatory functions, including modulation of neuronal excitability [74–77]. Further studies, using neurons derived from human stem cells with ablated NEAT1_2 expression and from ALS patients’ iPS cells, are required to understand whether paraspeckles are protective for motor neurons in the disease context and in the long-term. This shall help us understand whether, how and when paraspeckles can be targeted for therapeutic purposes. We acknowledge the Sheffield Brain Tissue Bank and London Neurodegenerative Diseases Brain Bank for providing human materials. TAS is a recipient of a fellowship from Medical Research Foundation. The study was also funded by Research Grant from Motor Neuron Disease Association to VLB (Buchman/Apr13/6096) and miRNA analysis was supported by the Russian Science Foundation grant (18–15-00357). HA and PD are recipients of Cardiff University/China Council PhD studentship and Erasmus studentship, respectively. TAS conceived research; TAS, HA, MSK, PD, SA, OS and PRH performed experiments; TAS and VLB analysed data; TAS wrote manuscript with input from all authors. All authors read and approved the final version of the manuscript. Human samples from clinically and histopathologically characterised ALS cases and neurologically healthy individuals were provided by the Sheffield Brain Tissue Bank and MRC London Neurodegenerative Diseases Brain Bank (Institute of Psychiatry, King’s College London). Consent was obtained from all subjects for autopsy, histopathological assessment and research were performed in accordance with local and national Ethics Committee approved donation. West JA, Mito M, Kurosaka S, Takumi T, Tanegashima C, Chujo T, et al. Structural, super-resolution microscopy analysis of paraspeckle nuclear body organization. J Cell Biol. 2016; https://doi.org/10.1083/jcb.201601071. Ma H, Han P, Ye W, Chen H, Zheng X, Cheng L, et al. The long noncoding RNA NEAT1 exerts Antihantaviral effects by acting as positive feedback for RIG-I signaling. J Virol. 2017;91 https://doi.org/10.1128/JVI.02250-16. de The H, Le Bras M, Lallemand-Breitenbach V. The cell biology of disease: acute promyelocytic leukemia, arsenic, and PML bodies. J Cell Biol 2012;198:11–21. doi: https://doi.org/10.1083/jcb.201112044. Zhang T, Wu YC, Mullane P, Ji YJ, Liu H, He L, et al. FUS regulates activity of MicroRNA-mediated gene silencing. Mol Cell 2018; 69:787–801 e8. doi: https://doi.org/10.1016/j.molcel.2018.02.001. Li R, Harvey AR, Hodgetts SI, Fox AH. Functional dissection of NEAT1 using genome editing reveals substantial localisation of the NEAT1_1 isoform outside paraspeckles. RNA. 2017; https://doi.org/10.1261/rna.059477.116.